Canada is full of superlatives and amazing wonders. Here is a list of some of the "firsts", "longest", and "biggest" things that occurred in Canada. Please send me suggestions to this list. The United Nations ranked Canada the #1 country in the world in which to live for seven consecutive years (1992-1999 inclusive). Canadians' life expectancy is among the highest in the world at 76.12 years (males) and 82.79 years (females). Canada is expected to have the second highest life expectancy rate by the year 2020 at an average of approximately 83 years. Canada leads the G-7 countries and is in second place in the OECD (behind Sweden) in terms of the lowest long-term unemployment rate, meaning unemployment lasting longer than 12 months. The World Bank ranks Canada the second richest country in the world, after Australia. Canada has one of the lowest inflation rates in the G-7 and the OECD. The Hudson's Bay Company once owned over 10% of the earth's surface and is still around as the world's oldest company. Canada has the longest coastline in the world: 243 792 kilometres, including the coastlines of 52 455 islands. Hudson Bay is the bay with the longest shoreline in the world. The biggest island in Canada is Baffin Island, which has an area of 507 451 km2. Lake Superior is the largest freshwater lake in the world, with an area of 82 100 km2. The world's longest inland waterway open to ocean shipping is the St. Lawrence Seaway-Great Lakes Waterway, which was opened in 1959. It is 3790 km in length, from Anticosti Island to the head of Lake Superior. The deepest lake in Canada is Great Slave Lake (NT), which has a depth of 614 metres. The highest waterfall in Canada is Della Falls (BC), at 440 metres. The largest earthquake recorded in Canada occurred off the Queen Charlotte Islands (BC) on August 22, 1949, with a surface wave magnitude of 8.1 on the Richter Scale. Niagara Falls is the largest waterfall in the world by volume, averaging 2583 metres3 of water per second on the Canadian side (Horseshoe Falls) and 233 metres3; per second on the American side. The oldest rock in Canada is thought to be Acasta gneiss, found east of Great Bear Lake (NT). It is 3.96 billion years old and part of a large fragment of the Earth's earliest crust. The first daily newspaper in Canada was the Halifax Gazette, which was founded in 1752. The first black newspaperwoman in North America was Mary Ann Shadd, who operated the Provincial Freedman in Windsor, Ontario, starting in 1853. The first French-language radio station in Canada was CKAC, Montreal, which has been on the air since 1922. The Canadian satellite Alouette 1, which was launched in 1962, was the first non-American, non-Soviet satellite to orbit the Earth. The world's largest publicly attended film festival is the Festival of Festivals in Toronto, which began in 1976. The oldest continuously operating company in North America is the Hudson's Bay Company, established on May 2, 1670. Canada is the world's leading exporter of pulp and paper. The biggest hydro-electric power development in Canada is Quebec's James Bay project. The world's richest vein of silver was found at Cobalt, Ontario, in 1903. The world's largest uranium reserves are in Canada, with the richest deposits near Elliot Lake, Ontario. Canada is the world's leading uranium producer, accounting for 40% of the world's production in 1992. Canada is the world's leading producer of zinc, with 18.7% of the world's supply. The oldest operating mines in Canada are the Stobie Mine and the Copper Cliff North Mine in Sudbury, Ontario. Rockliffe Park, Ontario, is the Canadian municipality with the highest percentage of families with income over $70 000, at 91.2%. Jennie Trout of Stratford, Ontario, was the first women licensed as a doctor in Canada, in 1875. Louis La Corne was the first Canadian to grow wheat in Western Canada, in Saskatchewan in 1754. The first Canadian chocolate bar was created by Arthur D. Ganong and George F. Ensor of New Brunswick and sold by Ganong Brothers of St. Stephen in 1910. The most severe flood recorded in Canada occurred in the Toronto area following Hurricane Hazel, on October 14 and 15, 1954, when more than 180 millimetres of rain fell in 24 hours. Eighty-one people died, 4000 families were left homeless, and roads were swept away. The greatest one-day snowfall - 118.1 centimetres - occurred at Lakelse Lake, British Columbia, on January 14, 1974. Medicine Hat, Alberta, holds the record among Canadian cities for the most days without measurable precipitation: 271 per year. The driest region on record in Canada is around Arctic Bay, Northwest Territories, where only 12.7 mm of precipitation fell in 1949. The most devastating tornado in Canadian history was the Edmonton tornado of July 31, 1987, which killed 27 people, injured 200 and left 400 homeless, and caused an estimated $250 million of damage along a 40-km track. The first balloon flight in Canada was undertaken by Professor Louis Lauriat in Saint John, New Brunswick, in 1840. The first trans-Canada flight was made by a Canadian Air Force plane from October 7 to 17, 1920. Toronto's Lester B. Pearson International Airport is Canada's busiest, handling 20 million passengers in 1993. The first railway in Canada was the Champlain & St. Lawrence, built in Quebec between La Prairie and Saint-Jean-sur-Richelieu in 1836. The worst train wreck in Canadian history occurred at Beloeil, Quebec, on June 29, 1864, when a train plunged through an open drawbridge, killing 99 people. The speed record for a steam locomotive in Canada is 180 kilometres per hour, set by a Canadian Pacific Railway F-2a engine on a Montreal to Smith Falls, Ontario run. The first automobile manufactured in Canada was a steam-powered vehicle built by Henry Seth Taylor of Stanstead, Quebec, in 1867. The first gas station in Canada opened in Vancouver in 1908. The Trans-Canada Highway, from St. John's, Newfoundland, to Victoria, British Columbia, is the world's longest national highway, at 7699 kilometres. 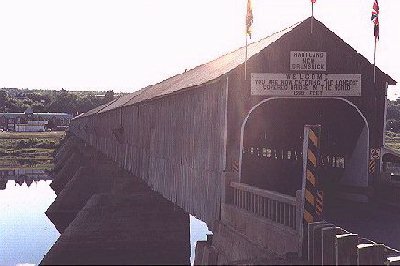 The longest covered bridge in the world (391 metres) is at Hartland, New Brunswick; it was built in 1897. The first sailing vessel on the Great Lakes was the Griffon, which was built by Sieur de LaSalle on the Niagara River in 1679. The first canal with locks in North America was built between 1779 and 1781 by British Royal Engineers at Coteau-du-Lac, Quebec, around the Cedres, Cascades, and Coteau rapids on the St. Lawrence River. Nova Scotia's Samuel Cunard built the ship "Royal William" which was the first ship to cross the Atlantic Ocean entirely by steam power in 1833. The largest aquatic animal in Canada is the blue whale (Balaenoptera musculus), which can reach up to 27 metres in length and weigh 132 tons. The smallest mammal is the pygmy shrew (Microsorex hoyi), whose total length is 9 centimetres (of which one third is tail). It lives throughout Canada except for the Far North. The longest and largest insect migration in North America is that of the monarch butterfly (Danaus plexippus). Millions travel every fall from southern Canada to central Mexico, a total distance of 8000 kilometres, and a few even travel back again in the spring. The polar bear (Ursus maritimus) is the biggest of Canadian carnivores. Adult males average between 400 kilograms and 600 kilograms, with some individuals exceeding 800 kilograms, making them the world's largest non-aquatic carnivore. The oldest continuously played sport in North America is lacrosse, which was widely played in pre-European times. Modern lacrosse rules were drawn up by Dr W.G. Beers in Montreal in 1860. The greatest performance ever by a Canadian in the Olympic Games was that of speed-skater Gaétan Boucher of Charlesbourg, Quebec, who won two gold medals and one bronze in Sarajevo in 1984. The first Canadian on the Ferrari racing team (from 1978 to 1982) and the greatest-ever Canadian driver was Gilles Villeneuve of Berthierville, Quebec. The first art gallery in Canada was opened in 1833 by Quebec City painter Joseph LMgarM, who was also the first Canadian-born painter to devote himself to landscapes. The largest repertory theatre in North America is in Stratford, Ontario, with an annual budget of $25 million. The oldest professional ballet company in Canada is the Royal Winnipeg Ballet, which was founded in 1949. The first Canadian recording artist to sell one million albums in Canada was Bryan Adams with Reckless in 1985. The first Canadian writer to win the French literary prize the Prix Fémina was Gabrielle Roy of St. Boniface, Manitoba, for The Tin Flute in 1945. She was also the first woman admitted to the Royal Society of Canada. The oldest university in Canada is the University of King's College, established in Windsor, Nova Scotia in 1789. It is now part of Dalhousie University in Halifax. The Queen Elizabeth Planetarium, Canada's first, opened in Edmonton in 1962. The largest library in Canada is the University of Toronto Library, with 7 900 000 volumes. The first credit union in North America was founded by Alphonse Desjardins in Lévis, Quebec, in 1900. The world's tallest totem pole from a single log (38.28 metres) was carved by Mungo Martin in Beacon Hill Park in Victoria, British Columbia, in 1958. Canada is the only country to have participated in all United Nations peacekeeping operations. Lester Pearson was the first Canadian to win the Nobel Peace Prize, in 1957, for his idea of a United Nations Peacekeeping Force. Canadians enjoy the longest uninterrupted corridor of cellular telephone service in the world - from Windsor, Ontario to Sydney Nova Scotia. North America's first known dwelling is the 20 000-year-old Bluefish Caves in the Yukon. The red and white Canadian flag was officially unfurled for the first time on February 15, 1965, on Parliament Hill, in Ottawa. Sir Wilfrid Laurier took office as Canada's first French Canadian Prime Minister on July 11, 1896. Under the Official Languages Act, which was passed in 1969, federal departments and agencies must provide French-language services in areas where the number of Francophones warrants it. The Constitution Act, 1982 made French one of the country's two official languages. The Canadian Constitution guarantees the use of French in Parliament, in the courts, and in all federal bodies. Canada has been led by prime ministers from Quebec for 26 of the past 28 years (Trudeau, Mulroney, and Chrétien). Canada plays an active role on the international scene. It has developed partnerships with international financial institutions, such as the World Bank and regional development banks, and with multilateral organizations, such as the World Health Organization, UNICEF, and the World Food Program. This allows Canada to share responsibilities for world development with other donor countries. In 1995, about 80% of Canada's exports went to the United States and 70% of our imports came from the U.S. Canada's second and third largest trade partners are the European Union and Japan, respectively. Canada has, with the United States, the highest population growth rate among G-7 countries in 1993. Canada had the lowest population density (inhabitants per kilometre2) among the G-7 in 1993 and was second with Iceland behind Australia in OECD countries. Canada had the second highest female participation rate on the labour market behind the United States in 1994 of the G-7. According to the United Nations, Canada is the best country in the world for providing access to education. We have the highest proportion of young people (age 6-23) enroled in formal education, and the highest enrolment in universities of any country. Canada has one of the best economic, employment and investment records in the G-7 countries since 1960. Canada-U.S. trade flows are the largest in the world. The volume of goods, services and income flowing between Canada and the United States is the largest two-way trade in the world, Canada is the U.S.'s best export market. Canada has a diversified and open economy with exports representing more than 40% of the GNP in constant dollars. Canada is a global force in a number of modern industries like telecommunications and engineering. From 1984 to 1994, there was a net gain of more than 800 000 new jobs in Canada for those with advanced post-secondary education. The co-founder and first president (1948-53) of the World Health Organization was Dr. Brock Chisholm of Oakville, Ontario. The Queen Charlotte Islands (BC) were the site of the first canadian gold rush, in 1851. The largest bay in the world measured by shoreline length is Hudson Bay. The oldest continuously operating outdoor market in Canada is the Byward Market in Ottawa, in business since 1848. The oldest continuously operating brewery in North America is Molson, in Montreal since 1786. The world's richest area of dinosaur fossils is in Dinosaur Provincial Park, Alberta. Quebec has the most dairy cows of any province, 40% of the Canadian total. The first hospital insurance plan in Canada was introduced in Saskatchewan in 1947; the province also had the first Medicare plan, in 1962. Canada is the world's second largest country after Russia. France could fit 18 times and the United Kingdom 40 times into Canada. Temperatures in Canada have ranged from 45°C (113°F) in Midale, Saskatchewan to -63°C (-81°F) in Snag, Yukon. Canada leads the world with 755 165 km2 of fresh water convering 8% of its total land area. Montreal's Maurice Richard was the first hockey player to score 50 goals in a single season (1944-1945). Herve Filion on Angers, Quebec, is the undisputed world champion of harness racing, having won 6290 races between 1953 and 1977. A car with its motor turned off will seem to climb magically to the top of Magnetic Hill, near Moncton, New Brunswick, because of a remarkable optical illusion. Canada possesses the largest park in the world - Wood Buffalo National Park, which spans the northern section of Alberta and a southern corner of the Northwest Territories. In March 1978, at the World Figure Skating Championships in Ottawa, Vern Taylor of Toronto became the first skater in the world to sucessfully complete a triple axel jump during competition. There are more grain elevators in Thunder Bay, Ontario, than in any other place in the world. Their total capacity is 37.4 million hecolitres. The Daniel Johnson Dam on the Manicouagan River in Quebec is the world's largest multi-arch dam. The hydraulic lift lock on the Trent Canal at Peterborough, Ontario, reaches a height of almost 20 metres, making it the highest lock of its type in the world. Canada has ranked first in world production of zinc, second in nickel, potash, and asbestos, and third in gold and silver - all in a single year (1979). Canada has more than half of the world's lakes within its border.